“Every moment is an organizing opportunity, every person a potential activist, every minute a chance to change the world.” Dolores Huerta. This week the pilgrimage is hosted in the California Central Valley by the Dolores Huerta Foundation. We are grateful for their leadership and for their contribution to justice and democracy. And for arranging a very diverse series of meetings, interviews, and a youth exchange with diverse Fresno area organizations. Yesterday, we were invited by the young people we met at Barrios Unidos, to a march dedicated to stopping violence. Eight young people have died by gun violence in the last two months alone in this neighborhood. The march was organized by H.O.P.E. Coalition and Barrios Unidos. 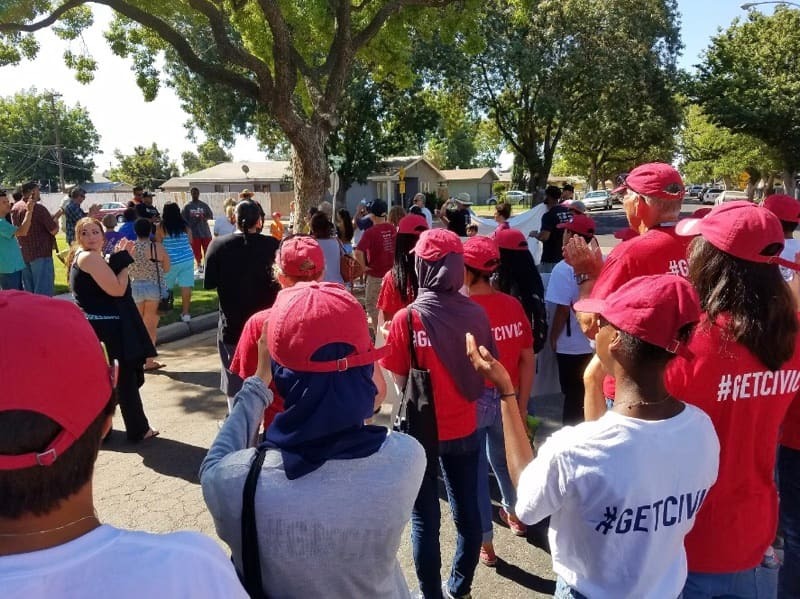 We marched and sang, threading our way among the homes and apartments in the Quigley Park community. A small neighborhood that has been impacted by eight murders in the last two months. Violent bloodshed is an endemic here. We also know that gun violence is a major contributor to fear and psychological trauma. We cried and hugged with family members, whose message is a simple one: Jobs are the best way to end violence. Livable wage jobs will eliminate violence. Violence will stop as more and more people become involved not only to help stop it in the community, but to also elect public officials dedicated to the funding and the social uplift programs that will end violence.